Sometimes getting a good night’s rest can be tough. There can be a lot going on in your mind after working a full day. Jennifer Williamson, author of SLEEP RITUALS, shares her advice on how to turn the bedroom into a sanctuary. Designate bedtime apparel. Sleeping in the same clothes you wore today sends mixed messages. Select breathable clothing dedicated to sleep: breezy nightdresses, cozy pajamas, oversized T-shirts. Associate your bed with fatigue. Avoid paperwork, news, email, text messages, games, arguments, and any stimulating or stressful activities. Get out of bed and perform some rituals if you have trouble falling asleep or staying asleep, rather than tossing and turning. Share your bed with care. If pets are taking over, it may be time to reclaim your space (this may be one of the harder decisions you make, but whatever you decide, decide consciously). If it’s more of a partner thing, invest in a bigger (quality) mattress where you can both sleep in comfort. Eliminate distractions. Remove the television, computer, bills, and exercise equipment. If these items must stay, unplug and create a barrier using a lightweight folding screen or beautiful fabric hung from a curtain rod or draped over items. Ban technology. Disengage from the world by turning off all electronic devices and/or leaving them in another room. At the very least, put them on airplane mode. There is a time and a place for everything under the sun: stimulation jives with the sun; restoration is the moon’s specialty. Live by nature’s rhythms and give your screen some space. 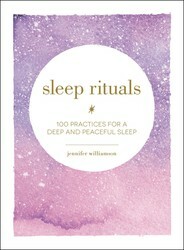 Find out how to get the best sleep in SLEEP RITUALS by Jennifer Williamson! Excerpted from Sleep Rituals by Jennifer Williamson Copyright © 2019 by the author. Used by permission of the publisher. All rights reserved. 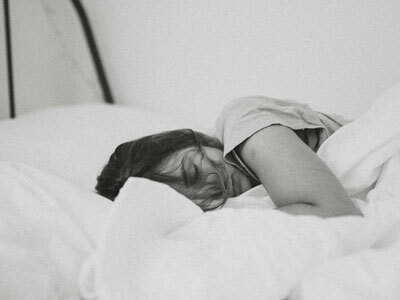 100 simple practices and activities to incorporate into any bedtime routine to help you fall asleep easier and wake up refreshed and renewed.Do you have trouble getting—and staying—asleep? Sleep rituals can set the mood for restful slumber and help you drift off in peace—let these recommended bedtime routines be your key to a good night’s sleep! This accessible guide offers 100 easy rituals—including sleep-friendly recipes, relaxing yoga poses, calming breathing exercises, soothing meditations, and comforting writing exercises—suited for every type of person. You can even mix and match them for a completely customized bedtime experience and find the perfect solution to banish any sleepless night.